It seems like gyms and specialty fitness classes are popping up everywhere – in strip malls, next to office suites, and under apartment complexes in dense cities. The noise they generate, whether from loud music, clanking weights, or dozens of spinning stationary bikes, is causing an inundation of noise complaints, 911 calls, and even forcing some fitness studios to move into isolated industrial areas. Door Seal Kit – A great addition to solid core doors, these adjustable surface-mounted seals are inexpensive, easy to install, and have a big impact on noise reduction. AcoustiBlox Quiet Mat – This is a heavy-duty vibration-reduction pad that’s easy to use and cost-effective. Able to serve as a finished floor surface covering an entire gym or fitness studio, this mat is also great for use under machines – and its textured surface helps prevent slipping or unwanted movement. Duct V-Max – Since ducts can carry a lot of vibration, this lightweight vibration damper for ductwork can reduce rattling noises in air ducts. RSIC Clips/Channel – This decoupling system is one of the most cost-effective and high-performance solutions in use today. 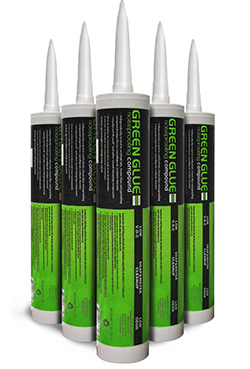 Green Glue® – A highly-effective viscoelastic damping compound, Green Glue is used between construction materials such as two layers of drywall or wood. AcoustiSealTM – A professional-series acoustical sealant exceeding LEEDTM requirements, this easily dispensable solution is a highly cost-effective method to stop noise leakage through joints and edges. AcoustikTM – A cost-effective and easily-installed floor underlayment made of recycled rubber, Acoustik can reduce the transfer of vibrations created by walking, running, or exercise equipment. Soundproof Doors and Windows – Depending on specific requirements, fitness studios can implement soundproof doors and windows or Climate Seal Window Inserts to greatly reduce sound leakage through these openings. It’s important for both tenants and landlords to understand that, although they can reduce noise in gyms and studios, no practical level of soundproofing could ever completely dampen the sounds and vibrations of 600 lb. tractor-tire flips or 300 lbs. of weights falling onto the floor. There are, however, many ways to begin creating a more pleasant environment for gym patrons and neighbors alike. To learn more about the diverse soundproofing solutions at Acoustical Surfaces Inc., visit our sound blocking product page. With summer just around the corner, more and more people are hitting the gym and attending group fitness classes such as spin cycling, yoga, CrossFit, and other health-oriented activities. An important key to any successful workout or class, of course, is listening to the instructor. Unfortunately, many gyms and fitness spaces are highly reverberant, making it difficult — sometimes even impossible — to hear the teacher clearly. Hard flat surfaces, which are typical in fitness centers, reflect sound rather than absorb or diffuse it, and these strong untreated reflections create echo and reverberation, which in turn create destructive sound interference. Consider how difficult it might be for a student sitting in the last row of a large hard-surfaced classroom to accurately understand what the professor in the front of the room is saying, even if the room was relatively quiet. The same is true of fitness spaces. While every fitness space has unique qualities, they all face the same troublesome sound issues if the flat-surface walls and ceilings are left untreated. Yoga studios should be peaceful and echo-free, spin participants should be able to hear their instructors over the music and “self-noise” of the cycles, and boxers should be free of distractions like clanking weights and stereo systems. If a space is left untreated, all the undesired sound reverberations will create sound “masking”, which greatly reduces speech intelligibility. PVC Baffles – Hanging baffles are popular for their reasonable cost, durability, and wide color variety, and can be hung from various types of ceiling structures like girders and beams. WallMate® – Available in a broad range of styles and fabric colors, these décor-friendly wall systems are designed to be easy for any commercial contractor to install. PEPP – Made of porous expanded polypropylene (PEPP), these acoustic panels are impact-, water-, bacteria-, and fungi-resistant, and are also cost-effective and very easy to install. Fabric-wrapped-panels – These panels are versatile, absorbent across a wide range of frequencies, and available in a variety of sizes and colors, and look great in upscale environments. For over 35 years, Acoustical Surfaces, Inc. (ASI) has created solutions to help control sound. Our products have solved problems across a wide variety of exercise rooms, gymnasiums, and home fitness centers. With the help of our acoustical products, your class instructors will be able to more effectively communicate and motivate their attendees. To find the right sound absorption product for your fitness space, visit our website. When it comes to the consumer experience in retail settings, acoustics play an essential role in regulating their spending and levels of satisfaction. The acoustical environment of a business can make or break a customer’s experience within the establishment and can have a direct effect upon their spending. Too much noise can have adverse consumer reactions, but so can too little. Ambient background noise, recorded music, and a complete lack of either are all factors that have unique, particular effects upon a consumer’s shopping experience. In a research study carried out by Ravi Mehta, a professor of business administration at the College of Business at Illinois, it was deduced that a moderate amount of ambient noise — equivalent to about 70 decibels — may amplify consumers’ creative problem-solving skills and lead them to purchase more innovative products in particular instances. On the other hand, higher, increased noise levels of about 85 decibels or higher produced rather adverse effects in customers. Meta and his research partners — Rui (Juliet) Zhu of the University of British Columbia and Amar Cheema of the University of Virginia — found that increased degrees of noise directly hindered a consumer’s creative responses, making them less likely to purchase more innovative and advanced products. Unsurprisingly, it was reported that as noise levels rise, so does a consumer’s inability to concentrate. A bit of noise can prove helpful for businesses — moderate levels of noise distraction can actually induce creative and out-of-the-box thinking in customers. But if ambient noise is raised too high, creative thinking is inhibited, potentially to the point of it being squandered entirely. If the noise level is decreased below the “moderate” amount of 70 decibels, however, creative decision-making and purchasing is also hampered. A balanced middle ground, then, will provide customers with an experience that is conducive to creative thinking and purchasing, and provides a pleasant, constructive ambience. At Acoustical Surfaces, we excel at providing high-quality soundproofing to retail spaces. Our wide variety of products can serve a range of professional needs and applications, and include sound silencers, silk metals, Polymax panels, and Wallmate high tension fabrics, to name a few. We recognize the challenges and inconveniences posed by noise and sound pollution in retail settings, and as such, we’re fully equipped to quell such issues. Acoustical Surfaces is capable of providing your business with the soundproofing equipment you need for success, regardless of size or acoustic issues. Please visit our catalog for an in-depth look at the sound-proofing solutions we offer, or contact us today for more information. Have you ever been to a busy restaurant that was so noisy you could barely hear your friend across the table? From an acoustics standpoint, restaurants are tricky spaces; the hard surfaces of the tables, bar, and floor are carefully designed to match the menu and overall aesthetic, but they can make a quiet Tuesday lunch sound very different from a packed Friday night. It’s no surprise that crowded, noisy atmospheres result in dissatisfying customer experiences. In a recent Zagat survey, noise level was the second most common complaint of restaurant goers after bad service. Additionally, a Consumer Reports survey of almost 50,000 readers reported that one in every four dining experiences warranted a noise complaint. Customers aren’t the only victims of sound pollution; the Occupational Health and Safety Administration (OSHA) monitors volume to protect employees from environments that could cause hearing loss over time. OSHA’s standards include a maximum noise level of 90 decibels per every 8 hours and 95 decibels per every 4 hours. Oxford University experimental psychology professor Charles Spence noted that noise levels in many restaurants hover around 100 decibels. Recent studies have found that not only do bad acoustics hurt our ears, but they can also affect the way we taste our food. A 2010 study in scientific journal Food Quality and Preference found that participants perceived saltiness and sweetness more strongly when eating with quiet or no background noise, compared to participants who ate the same foods with loud background noise. A 2012 University of Manchester study found that people enjoyed their food more when they also enjoyed the background noise (pleasant music, for example), while participants who ate with 80-decibel white noise in the background reported dulled flavor perception. We’re learning that existing background noise, and the acoustical products used to counter it, have the power to transform the dining experience. Acoustical experts should be consulted at the start of any restaurant building or remodeling to harness this power. Products like fabric wrapped fiberglass or echo elimination panels can minimize the noisy cocktail party effect we’ve all experienced. Acoustical Surfaces, Inc. has 35 years of experience in improving surface acoustics. Managing volume can be difficult in a continuously changing environment like a restaurant. At Acoustical Surfaces Inc., we offer a variety of mounted wall panels, silk metal, and ceiling-hung baffles to knock out the unwanted noise and offer a more pleasant experience for your customers and employees. To learn more about our acoustical surface offerings and our proven restaurant industry success, please contact us to consult an acoustical expert. Acoustical Surfaces Inc. specializes in soundproofing, acoustics, and noise/vibration control. To give you a better understanding of what we do, we produced a video on acoustics. It’s designed to provide an overview of the basics of acoustics for those who are new to the subject. The video also explains the very first thing that you need to know about acoustics and acoustical products: the difference between soundproofing and treatments. Both are different and represent two distinct goals. The video addresses some common misconceptions about both. Soundproofing helps keep noises out and sounds in. It is analogous to weatherproofing, where you need to eliminate all holes and cracks where the weather can get inside or where air-conditioned air could escape. Soundproofing consists of solidifying structures and increasing isolation — which means ensuring that there are no holes for noise to infiltrate the room or for sound to escape. Sound leaks from doors and windows are easy to fix with door seal kits or soundproof doors and windows; but soundproofing light-fixtures, lightweight walls, air duct vibrations, and thin floors are more challenging. Doing so means increasing the mass of structures to reduce sound transmission through vibrations, and sealing all holes. Treatment is all about improving the acoustical properties of a room: it helps enhance the quality of sounds in a room (watch this video to learn more). To do this, flat surfaces are converted to porous, curved surfaces. Porous materials improve acoustical properties by absorbing sound energy, and curved surfaces improve acoustical properties by diffusing, or spreading out sound energy. Porous Absorber panels work by reducing sound energy. Sounds are absorbed by the porous material rather than reflected back into the room. Curved surfaces (known as curve diffusors) help to spread out sound energy, reducing the intensity of any sound reflected back into the room. Our website contains a huge amount resources on soundproofing and treatment. We also sell a number of soundproofing products, including door seal kits and studio soundproof doors and windows, as well as treatment products such as curve diffusors and sound absorbing panels. Want to learn more about acoustics? Our experts are available to answer your questions. In this ongoing blog series, the acoustic experts of ASI will detail common noise concerns of different environments and offer solutions to resolve any issues. This month’s edition of What’s That Noise? focuses on gymnasiums—wide-open spaces that are highly conducive to generating echoes and reverberation. Upon entering a gymnasium, the first thing that people notice—almost immediately—is the noise. At any given time, there are dozens of unwanted sounds fluctuating throughout these recreational facilities. Squeaking sneakers, booming voices and footsteps, and piercing music are only some of the sounds you’ll encounter regularly. Gymnasiums aren’t limited to just exercise and sporting events; these multi-purpose spaces often serve as venues for banquets, concerts, performances, and business conferences as well. Regardless of their specific purpose, all gymnasiums are constructed similarly; they are always composed of wood, painted concrete or cinder blocks, and metal roof decks—all of which are highly reflective surfaces. When you combine large gym spaces, reflective surfaces, and a lack of absorptive surfaces (e.g. carpet, furniture, drapery or ceiling tiles), this results in excessive echoes and reverberations. With little to no absorption in the room, sounds constantly bounce around until running out of energy. This noise problem is especially troublesome when gymnasiums are for conferences or instructional events; speech intelligibility in the room suffers greatly since people hear sounds that have been reflected several times. This delayed response causes a lot of confusion, as people have difficulty distinguishing one sounds from another. To facilitate appropriate noise abatement, many gymnasiums are treated with hanging baffles or absorptive wall or ceiling panels. Baffles are ideal for this application, but it’s important to observe and take note of the fire suppression sprinklers; installing baffles in a location that’s inhibiting the coverage of the fire sprinklers is a huge safety concern. Acousitcal Surfaces, Inc. (ASI) has led the soundproofing industry for over 30 years. People frequently rely on our sound expertise to solve noise problems in various settings. In gymnasiums, our Echo Eliminator™ Acoustical Panels are a great resource for noise abatement for walls or ceilings. These panels are cost effective, lightweight, and easy to install. Our Echo Eliminator™ panels are sold in 2×4 panels and are available in 10 different colors in both 1” and 2” thickneses. In addition to possessing exceptional absorptive properties, these panels are also Class A fire rated to provide added security. It is also important to know that these panels are generally in stock and because they do not need to be made/fabricated, we can generally ship an order in just a few days. ASI’s PVC Wrapped Acoustical Baffles are also a popular choice for gymnasiums (with high ceilings and no fire suppression systems). These high-performance baffles are composed of heat-sealed polyethylene (PVC) with a fiberglass fill, making them absorbent enough to cut down reverberations. Our baffles are available in sizes up to 4’x10’, as well as various colors to compliment the design of you gym. Learn more about noise abatement by contacting Acoustical Surfaces, Inc. today. This month’s edition of What’s That Noise? focuses on office environments—enclosed areas that depend on quietness to ensure the clearest communication possible. Millions of Americans spend 40 or more hours working in office buildings each week. Unfortunately, not all the time spent by office employees is productive, as the buildings they work in are a constant source of unsolicited noise. If you’ve worked in an office, or even briefly visited one, then you are well aware of the noises people encounter in these buildings—keyboard clicking, calls with clients or other employees, and loud music are a few prime examples. These individual noises are irritating and distracting, but they aren’t the biggest problem befalling offices today; sound transmission from room to room is the real culprit. Interestingly enough, the construction of office buildings is what promotes sound transmission. During construction, components like heating and cooling systems, water pipes, are run along the ceiling of a building. Next, walls are built and a “drop-ceiling” is installed to cover the surfaces. Finally, doors are installed and the rooms are finished. In each of these areas, very little attention is given to sound absorbing materials. People tend to assume that walls are the main source of sound transmission, but generally speaking, sound travels too fast (1,130 feet per second to be exact) to determine its precise location. Regardless of location, these sounds interfere with office productivity, and often cause confusion among employees. It can be challenging, but the first step is to try and pinpoint the general problem area—your choice of noise abatement products will depend on the specifics of the room. For ceiling tiles, the Acoustical Surfaces team recommends two exceptional products: NOISE S.T.O.P.™ Sound Barrier ACT Tiles offer both high sound absorption (for echo and reverberation within a room) and are designed with a noise barrier on the back of the tile to help to block sound from entering or leaving an office; Barrier Decoupler can be used on the back of STANDARD ceiling tiles to reduce sound transmission and contain intrusive noises. For office doorways, we recommend Door Seal Kits—these products are adjustable, durable, and are ideal for decreasing the amount of sound transmission through door seals. Our door seals are easy-to-install and available in several custom sizes. Finally, adding wall panels will help absorb echoes and reverberation throughout the office. Our NOISE S.T.O.P. FABRISORB™ fabric-wrapped fiberglass panels are custom engineered to provide high-performance noise reduction in any office area. These panels can also be fabricated with a core of a dense, heavy vinyl that will offer the ability to block sound transmission as well. Learn more about our noise abatement and soundproofing solutions by contacting Acoustical Surfaces, Inc. today. Large cities with large populations and lots of concrete are always going to be noisy, that’s just part of the game when it comes to living in the city. If you don’t like noise, it’s probably not the right place for you. But, even in a big city, people should be able to create quiet, comfortable spaces to unwind. Fortunately there are quite a few different products that can be used to reduce the amount of sound coming into a building. 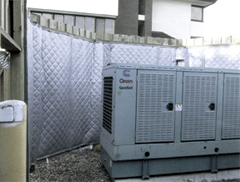 Exterior Grade Quilted Barrier-blankets can be used around noise sources outside such as: Generators, AC Units, etc. I manage an office building, and we have some mechanical equipment on the ground floor next to the building that has caused some noise complaints. Is there a somewhat easy and affordable solution to this? Exterior acoustics and sound reduction can be a bit of a slippery slope due to the amount of variables involved and the fact that the products must be used outdoors, but there are absolutely ways to fix or address problems such as these. When a machine is running on the outside of a building, a few things happen. The machine, obviously, creates a sound/noise that travels from the machine toward a potential listener in a relatively straight line. At the same time, the sound coming out of the back (or the building side) of the machine is quickly reflected off of the hard surface that makes up the outer wall of the building. Reducing this reflection can sometimes reduce the problem to an acceptable level, but more often than not, some kind of wall or enclosure will be needed. As I mentioned above, exterior acoustics can be more involved than sound treatment inside of a building because of the vast number of variables involved. In this instance, the machine is bothering people in the adjacent neighborhood. The machine already has a chain-link fence installed around it to keep the machine secure, which is good, as we’re going to need a structure around the machine to support the product. The most successful product that I have used over the years is the Exterior Grade Sound Blankets which are a lot like a U.V.-stable fiberglass absorber stitched onto a piece of 1lb-per-square-foot mass-loaded vinyl. Imagine a moving blanket sewn onto a piece of lead and you’ll get the idea. These are custom-made panels that will have rows of grommets used for installing the panels onto the fence, and usually vertical, exterior-grade Velcro® seams to attach one panel to the one next to it. They are custom-made on a per-job basis to fit the fence or structure in question. They are very acoustically effective and will last a number of years — even when they are used in the most extreme types of environments. One thing to consider is that these blankets will essentially act like sails and they may not be the right choice in extremely windy or unsupported types of installations. As I mentioned earlier, another option is to reduce the sound pressure from the echo off of the building, which can sometimes offer enough performance to get you to where you need to be. This is typically done with the EFT-QFA panels. The sizes and locations for these panels should be considered on a per-job basis so feel free to contact me with the details below and we can discuss it specifically. These panels are simply the absorptive part of the curtain panels mentioned above. Since the building is already a better barrier than the 1lb vinyl, the barrier-part isn’t needed. A newer product to come to market is the Echo Barrier panel. This is an in-stock, exterior-rated sound panel that has been pre-fabricated to ~6.5′ × 4.5′. They are overlapped when installed panel-to-panel rather than attached to one another with Velcro®. One very nice option with these panels is that they can be rented or leased. This allows the customer or end user to lease them for a period of time, rather than purchasing them permanently. If the acoustical reduction is satisfactory, the lease can be bought out, or the lease can expire and the panels can be returned. If you are experiencing a situation like this, please feel free to send me an email to begin the discussion. A few photos of the situation are always helpful to assist me in understanding your situation. Many times, the address of the location/building can also be helpful as Google Maps or Google Earth allow me to get a bird’s eye view of the area. If you have any frequency-specific sound data, that is a wealth of information, but even your description of the type of noise can be helpful. I run a daycare facility that includes a small gym for games, running around, etc. The problem is the echo–it’s almost unbearable! The room has a vinyl tile floor, drywall walls and a metal roof deck for the ceiling. The room is 1500 sq/ft and has a 20′ ceiling. Is there anything I can do? Being a father of two young and active boys, I am all too familiar with the fact that kids can be loud. Get a bunch of them together in a room having fun and it can give you a headache pretty quickly. Especially if the room is made of hard surfaces, which is true for most gyms. The good news is that there are things that can be done. We have quite a few different types of acoustical panels and each has it’s own respective advantages and disadvantages. However, for a situation like this, I can pretty quickly narrow down the options to just one: the Echo Eliminator panels. These panels are about as cost-effective as it gets, they are in-stock, reasonable to ship, are class-A fire rated, available in nine different colors, easy to install and most importantly, extremely effective. They are, however, not as finished and aesthetically pleasing as some of our other options. But, 99.425% of the time gym or similar use rooms don’t need to be as aesthetically pleasing as an office or waiting area. The kids sure don’t care what the panels look like! Also, as I have said before, these panels can be installed essentially anywhere in the space and have, generally, the same overall reduction in the sound pressure in the room. I would suggest putting them high on the walls or mounting them directly onto the ceiling so they see less contact and abuse, but this is only for the longevity of the panels. They are most often applied to the walls or ceiling with two types of adhesives, but I have had people use everything from double-sided tape, to Velcro® or even 3M Command™ Strips. One of the classrooms that I did decided to pound grommets (with a grommet installation kit from the hardware store) and hang the panels from small hooks. The hooks were held up by one small finish nail, making for an easy patch job if the panels needed to be removed. It’s interesting, but I’ve noticed that when a room has been treated with acoustical panels and is quieter, the children playing in the room don’t tend to get as loud as they do in an un-treated space. When the background noise doesn’t exponentially increase with more voices, people don’t have to raise their voice to be heard by those around them. Further, when everyone in the room is speaking quieter, there is less energy to bounce off of the remaining hard surfaces. Instead of this ever-increasing upward spiral, the reverse is true. If you have any questions about this type of situation or if you are experiencing a problem like this, please feel free to contact me, I would be happy to help you determine how to approach the situation. If you can include the dimensions of the space a photo or two and your contact information (name, address, etc), it will be extremely helpful and make it easier to help you.